Every year, as your mouth experiences a savory delight and feels its sweet taste you just hanker for more. No matter how much we have them, we just can not seem to have enough of the 'Peeps'. Know the history of the 'peeps', one of the most loved confectionery items, the consumption of which has become one of the major Easter customs. If you like this article on 'Peeps', click here and share it with your friends and dear ones. Happy Holidays! If you are an Amercian, there is no chance of your being unfamilair with the "Peeps". Billed as the most popular Easter candy in the United States, the "peeps" are greatly loved not only in the country of the Big Apple but also in many other parts of the world. This delicious candy treat originated in the preceding century and owes its birth to the Rodda Candy Company, a Pennsylvania confectioner. This candy house was famous for its jelly beans but it was also well known for its innovative creations. One of these imaginative products was the three-dimensional marshmallow Easter chicks, better known as the 'Peeps'. But the Peeps might not have come into the limelight had it not been for a man named Sam Born. A Russian immigrant, Sam Born opened a a small candy-making and retail store in New York City in 1923. As his business grew, he shifted his operations to Bethlehem and named his store "Just Born", which implied the freshness of his products as well as hinted at his wishful thought of lording over his rivals. "Just Born" survived the wars and major economic depressions to emerge a key player in the confectionery business and made several key acquisitions of which the Rodda Candy Company was one. Though the unique way of making jelly-bean was the reason 'Just Born' acquired Rodda in 1953, it was the 'Peeps' that interested Sam Born. At that time, the 'Peeps' were handmade in the back of the factory by only a few women who squeezed marshmallow through pastry tubes to make these novel treats. It was a laborious process and took 27 hours to make one 'Peep'. The process was simplified by Sam Born's son Bob, who mechanized the process of forming marshmallows. This turned 'Just Born' into the world’s largest manufacturer of innovative marshmallow treats. The mechanization of the marshmallow forming process made it possible for the company to produce and sell the 'Peeps' in large numbers which eventually turned it into the most popular Easter candy. 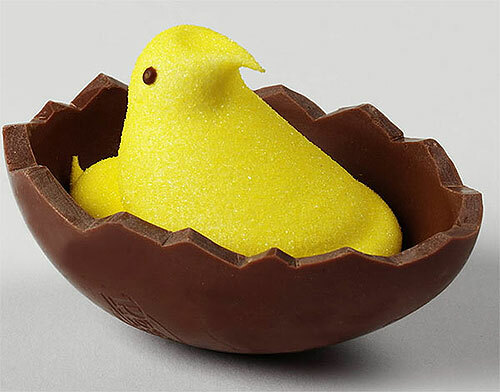 The clever choice of the chick as the 'Peep' shape added to its attractiveness as an Easter candy. As years passed, "Peeps" began to be created in newer shapes for various festivals, such as chicks and bunnies for Easter, cats for Halloween, reindeer for Christmas etc. The treats also came in newer flavours like chocolate mousse (for Easter or Christmas), cocoa (for Halloween), strawberry and vanilla (for Valentine's Day). In recent years, the 'Peep's have vastly grown in popularity to boast of a "cult" following in many parts of the world. In November 2009, the first Peeps & Co. store opened in Prince George's County. Last year also saw the expansion of the Peeps product line with the introduction of the 'Peeps Lip Balm' by "Just Born". These come in four flavors: grape, strawberry, vanilla, and cotton candy. Today, the "Peeps" have become an insperable Easter tradition. Approximately 5 million marshmallow chicks and bunnies are produced in preparation for Easter. The yellow Peeps are regarded as the most popular ones, followed by pink, lavender, blue, and white. Every Easter, more than 700 million Marshmallow Peeps are estimated to be purchased by Americans alone.